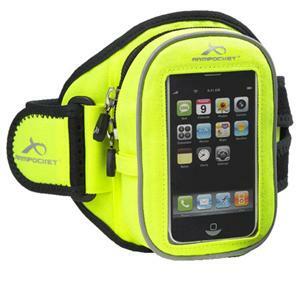 The Armpocket Sport i-20 Medium Armband (Yellow) protects your portable touch-sensitive electronic devices even electronic car keys from moisture damage! Also great for the gym school shopping or traveling. It is made of recycled plastic bottles (PET material). The vented moisture-wicking bamboo-rayon Armband and back keeps you cool comfortable and dry. The Armpocket's proprietary V-Armband design incorporates breathable memory foam back-padding that contours to the arm's natural shape - the more you generate heat - the more it hugs your arm! The heat and touch sensitive screen allows you to access smart phone applications or control your iPod/MP3 player while on the move! A locking audio-port on the bottom of the Armpocket Sport i-20 allows you to easily connect your headphones to your iPod/MP3 Player as well as manage your cord length.